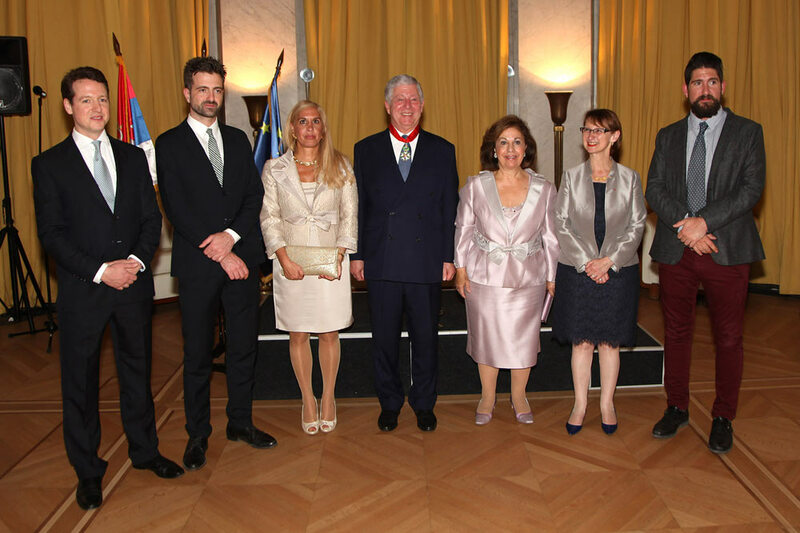 His Royal Highness Crown Prince Alexander received the highest French order, Legion d’Honneur Commander Rank, by a Decree of the President of Republic of France HE Mr François Hollande. The Ambassador of France HE Mrs Christine Moro hosted the reception at her residency this evening, and presented Crown Prince Alexander with this high order for his contribution in democratization of Serbian society. His Royal Highness was accompanied by Crown Princess Katherine and their children, Prince Peter, Prince Philip, Prince Alexander and Mrs Alison Andrews. HE Mrs Christine Moro has emphasized in her address: “Your Royal Highness, President of the French Republic wanted to honour your activities over the years for the benefit of your country, that is so close to heart of French people. Your destiny was to be born far away from your country, in London in 1945, where your father, King Peter II was forced to exile since 1941. I have to mention that tonight, through you personally, we are paying a tribute to long lasting French – Serbian friendship”. Thanking for this honour, HRH Crown Prince Alexander has said: “I am very touched and grateful for the honour bestowed on me by the Grand Master of the Legion d’Honneur, the President of the French Republic, His Excellency Monsieur Francois Hollande, and for the mediation of Your Excellency as the Ambassador of the Republic of France in Belgrade, on the occasion of awarding me the Commander rank of the Order, whose motto is “Honour and Country”. Indeed, honour and country are the virtues that drive people and nations. 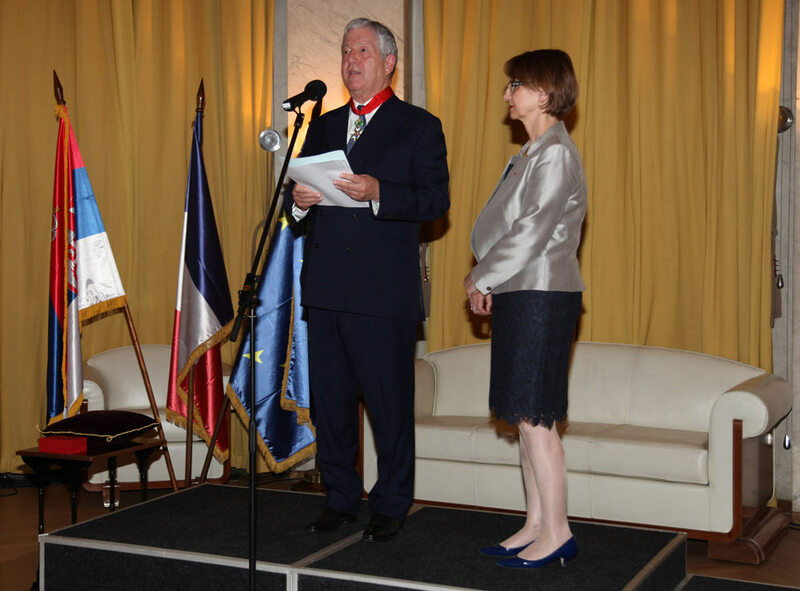 The Order of the Legion of d’Honneur is a part of my family’s history, which we are proud of. My great-grandfather, grandfather and father were Knights Grand Cross of the Legion of Honour. They were joined by my grandmother, Queen Maria, who was awarded the Grand Cross. Other members of my family, too, proudly wore the insignia of this institution on their chests, as well as many of my countrymen, soldiers and politicians, artists and scientists. In the two wars the Legion of d’Honneur was one of the pledges of our alliance and our joint fight for civilization! Belgrade, our capital, is one of the few world cities that holds the Order. It is an honourable tradition, and it is with great personal satisfaction that I say – this tradition has not disappeared!” emphasized the Crown Prince. The ceremony at the French embassy was attended by HE Mrs Maja Gojkovic, Speaker of the Parliament of Serbia, His Grace Bishop Arsenije of Toplica, Prof. Dr Oliver Antic, special advisor to the president of Serbia, HE Archbishop Orlando Antonini, Apostolic Nuncio, members of the advisory boards of the Crown, representatives of the Army of Serbia, members of diplomatic corps, and many other distinguished guests.